I am so happy this fine Regency mystery series continues to produce first rate reading. One of the great fears suffered by dedicated readers is that a beloved series will run out of steam. We've seen it happen before. Sadly, it's all too common. But fans of Sebastian St. Cyr, Hero, and all the wonderful secondary characters can rest easy. 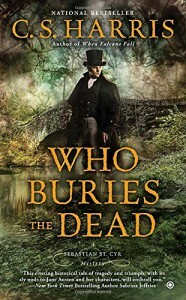 Who Buries The Dead is an excellent continuation into the story of Viscount Devlin's unpleasant hobby, investigating strange murders and related mysteries. Sebastian's life is complicated now by the addition of a wife and son, "hostages to fortune". He can't hurl himself headlong into danger without thinking of them as well, and that can hamper his detecting methods. Nonetheless, it's a cracking good story with lots of twists and turns and surprises. I recommend readers start with the first book and read them in order to get the full flavor of the series and an appreciation for C.S. Harris's writing.